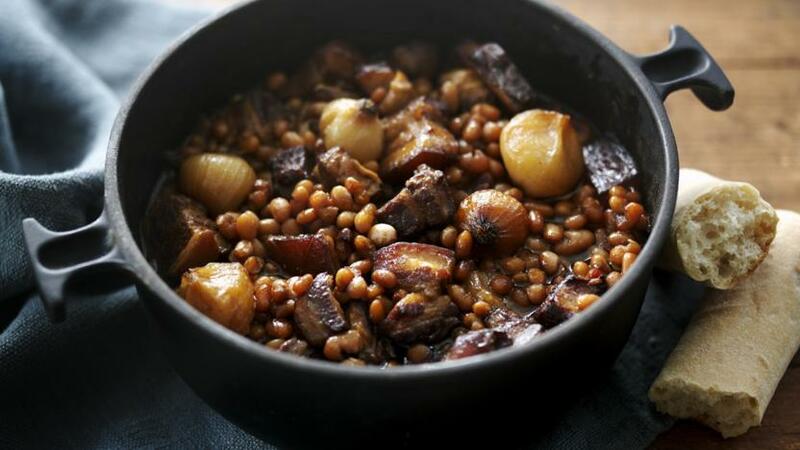 These Boston baked beans from Hugh Fearnley-Whittingstall are great on toast. Soak the beans overnight in plenty of fresh cold water. Drain and rinse, then put in a heavy, ovenproof pan or casserole, with fresh water to cover the beans by about 5cm/2in. Bring to the boil and boil hard for at least 10 minutes. Lower the heat to get a gentle simmer, cover with the pan lid, and simmer for about one hour until the beans are tender but not completely soft. Remove from the heat. Cut the pork belly in large 5cm/2in cubes, leaving the rind on and add to the beans. Stir in the brown sugar, black treacle and mustard. Press the cloves into an onion and add, with the extra onions, to the pot. Season with pepper, but no salt at this stage. If necessary, add a little hot water so that the beans are covered. Replace the lid on the casserole. Bake the beans into the oven to bake for about three hours. Then remove the lid and dragging some of the pork chunks to the top. Return, uncovered, to the oven, for a further hour. Season, to taste, with salt and freshly ground black pepper. Serve on it's own, with crusty bread (or on toast), as a snack or light meal. The baked beans will keep in the fridge, in a sealed jar or tupperware container, for two weeks. You can also freeze any leftovers. To cook this recipe in a slow cooker, boil the soaked beans for 10 minutes, then add them to the slow cooker with the remaining ingredients and cook on high for 6-8 hours.